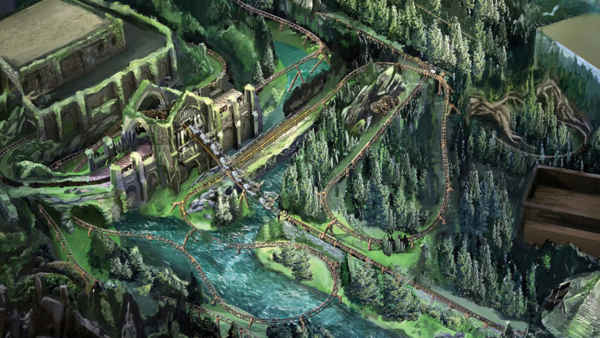 This summer, Harry Potter fans will finally get to experience the Forbidden Forest at Universal Orlando Resort. Hagrid's Magical Creatures Motorbike Adventure take you on a journey right into one of the "most dangerous places" at Hogwarts. Taking Hagrid's famous motorbike and sidecar you will fly through the forest, a place filled with creatures who aren't always the most friendly of magical beings. Luckily guests will have Hogwart's Gamekeeper and teacher, Hagrid to guide you. Guests will begin their journey into the forest in one of Hagrid's Care of Magical Creatures class, where they will then board enchanted motorbikes and accompanying side cars. The unique coaster seats mean that guests will get a different experience of the ride depending on which side they sit on. A perfect excuse to ride more than once! There's plenty of creatures to see throughout the ride including Fluffy, Cornish Pixies, Centaurs, and a new unseen creature. You'll also need to beware the Devi's Snare pit waiting to grab you. All of this whilst travelling speeds of up to 50mph! Universal have been working with Art Director Alan Gilmore, who helped bring to life J.K. Rowling's work on the big screen. Alan spoke at the UK Press Event celebrating the new ride's launch about his work, confirming that in order to bring the Forbidden Forest to life the team planted over 1000 trees into the attraction. Hagrid himself, Robbie Coltrane also attended the event to speak about his excitement to experience the attraction. This is set to be a coaster unlike anything guests at the resort have ever experienced before. With twisting turns, drops and even going backwards; the coaster has been designed to make you feel like you are actually flying. Just be careful. If you know anything about Hagrid, you know his lessons don't always go to plan. Hagrid's Magical Creatures Motorbike Adventure opens to guests at Universal Orlando Resort in Island's of Adventure on 13th June.